The Cuisinart CPT-122 is 2-Slice compact plastic toaster with stainless steel accent which can be placed anywhere or sideways in the kitchen. It has Reheat, defrost and bagel controls and comes in a compact design. 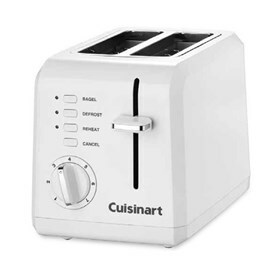 The Toaster is very easy to use and perfect for making thick bagel halves or thin sliced breads. The 2-Slice Compact Toaster has many exciting features for users of all types. You can extend the lifetime of your 2-Slice Compact Toaster with the purchase of a FactoryOutletStore Factory Protection Plan. See the 2-Slice Compact Toaster gallery images above for more product views. The 2-Slice Compact Toaster is sold as a Brand New Unopened Item.